Being ready to start feathering, the professional takes up four arrows in his left hand and smears a little hot glue on the feathering part, rubbing it smooth while turning the shaft with the fingers of the left hand, thus providing an even glued surface all around. Then he stands the shafts, nocks up, in a crib or rack for the glue to harden. Meanwhile, he applies glue to other shafts. And having carefully gauged his work, he is able to start his feathering and carry it through in the same sequence without the glue getting ahead of him, or becoming too hard. Here is where a warm room is essential. Be sure the worker will be deft and quick even hardening glue, but after taking each feather from the moist press it must be stuck on the arrow and adjusted before the feather itself dries. In this work I find ample time to glue a set of feathers and straighten them on three shafts before returning to the first of the three to look it over and do any final adjusting. 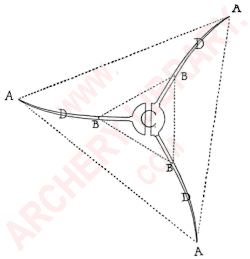 C is shaft, with perpendicular nock. D are the three feathers just glued to shaft. A are the extreme points which form the visual triangle which the eye fixes for setting the feathers equidistant. B are points of the final triangle formed by trimming the feathers. Paper clips and other contrivances may be used as aids in this work. But for the best results they should be avoided as bothersome makeshifts. I have never seen any good in any of such inventions. In England, for example, we had girls and women feathering arrows, some of whom had been at it for years. Their method was to leave the feathers twice as long as required, bind them on at each end with thread, one end loosely, raise the middle and run a glue stick under the quill, then draw the loose end tight and tie, leaving the arrow then for the glue to harden. This method called for marking the lay of the feathers with a gauged marking board, so that every one was placed exactly the same. But they never were allowed to do the work in this way for the best arrows. As I had four women working for me who were good at this sort of work I had opportunity to see the best they could do as to speed—assuming the method to have been intended to save time. But so far as I know the best of them never was able to feather twelve dozen arrows in a day of nine hours, and I can beat that by the old method used by the fletchers for centuries. They used twice as many feathers, and not a little thread, as this could not be used more than once. But of course they worked for considerably lower wages than the fletchers got.